Please note: the information published on this page are gathered from the internet, books, or from collectors writing me. 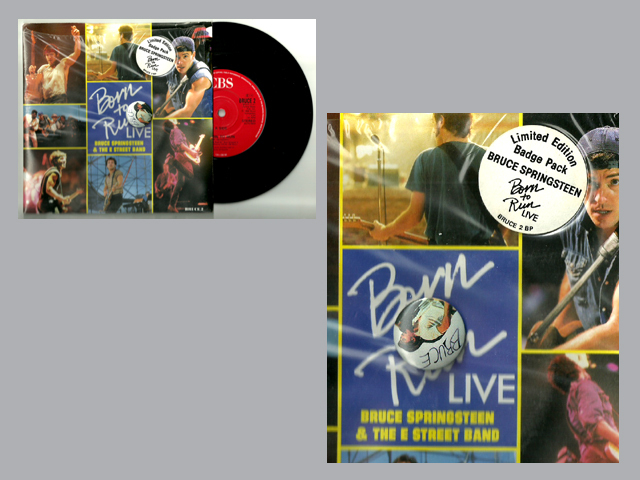 If you think the details I'm giving here are not correct, please share your thoughts with me, using the e-mail address contrib@brucespringsteen.it and correct any error I did, helping to build up a great reference site for all the bruce collectors. If you have better photos than the ones I collected about the item in question, you can send them in jpg format, ideal size is 200 - 300K, I'll manage to cut and compose them. Many descriptions and information are taken from the greatest site about Bruce Springsteen official discography, which, just in case you didn't know, is LOST IN THE FLOOD; so, be sure to consult it, too. It is really a great site. Limited Edition Badge Pack with pin inside. White sticker with code BRUCE 2 BP. Quite difficult to track down. I'm searching for this record : if you have a copy to sell or trade, please contact me !! !